Military personnel and survival experts trust the durability and interior cushion of the Small Cases from Pelican™, and so can you. 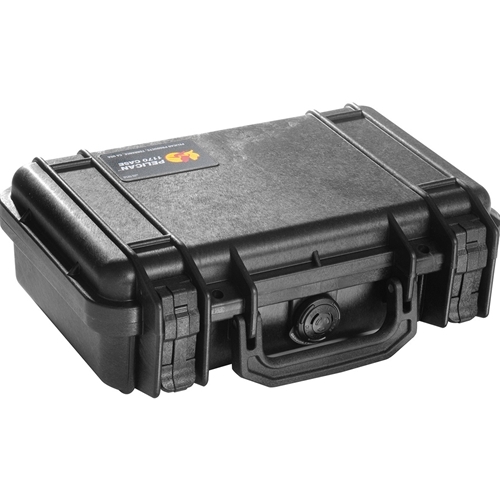 Thanks to its waterproof construction, the Pelican™ 1170 Case with Foam (Black) lets you safely transport your firearm, GPS, satellite phone, camera, or other digital or mechanized devices during your rugged outdoor adventures. Open-cell foam in the main body and inside the lid compresses around the contents to keep them from shifting and absorbing shocks during transport. Dimensions Inside: 10.54" x 6.04" x 3.16"
Dimensions Outside: 11.64" x 8.34" x 3.78"